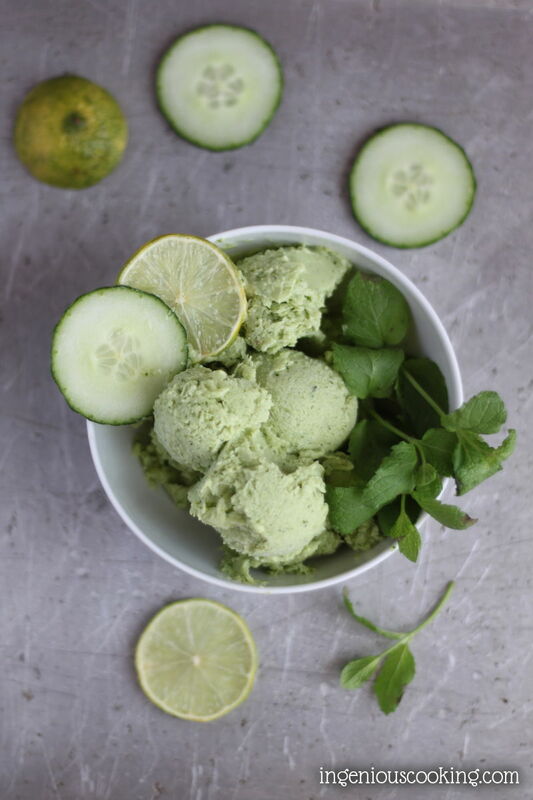 A creamy and refreshing mint ice cream made with only 5 ingredients, without sugar, dairy, eggs or nuts. No churn, vegan recipe. Rinse and clean veggies: scoop avocado, there's no need to peel the cucumber. Pour in a container of your choice and put in the freezer. I bet you'd get a creamier consistency if you'd mix your ice cream with a fork every 30 minutes to break any forming ice crystals. However, I didn't have the capacity to do that and my ice cream turned out just fine. Sure, there were some ice crystals but it was still creamy, scoopable (see photos). Let it sit in the freezer for the night. Leave it on the counter for 40-50 minutes to get scoopable. In case you don't feel like scooping, you can also make these in ice pop moulds. * Stick to fresh mint leaves, mint extract is too strong for this. ** You can sub any liquid or powdered sweetener you like for erythritol, but it has to be some significant amount: a pinch of stevia wouldn't do.